This recipe for Grilled Sausage & Egg Sandwiches with Sweet Mango Barbecue Sauce is sponsored by Smithfield. All content and opinions are entirely my own. Take the concept of breakfast for dinner outdoors this summer! These Grilled Sausage & Egg Sandwiches with Sweet Mango Barbecue Sauce are an easy way to make outdoor summer entertaining even more fun and delicious! 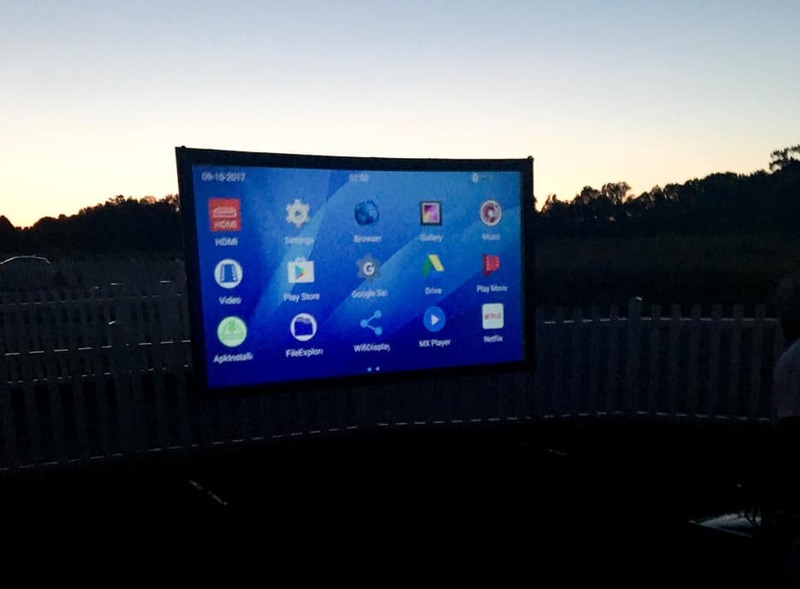 Last year, for my oldest son’s birthday, I brought up the idea of having an outdoor movie. When I ran the idea by my techy fiancé, he bought the screen and projector almost immediately. He loves movies so this idea was right up his alley. The birthday party was such a huge success that we now put the screen up any chance we get. It’s a great way to bring together friends, family, and even neighbors! The night we made this Grilled Sausage & Egg Sandwiches with Sweet Mango Barbecue Sauce recipe using Smithfield Hometown Original Fresh Breakfast Sausage Links, we also set up the outdoor movie screen, of course! Even if it’s just a family movie night, being able to take in a movie outdoors on nice evenings is so fun! We spend as much time outdoors as possible once the weather is nice. And, we cook on the grill more than indoors all summer long! Coming up with new ways to use the grill to add variety to our meals has been a welcomed challenge. More recipe testing? Yes, please! And, who doesn’t love breakfast for dinner? I can remember feeling like it was a special treat when my mom or dad put down sausage and eggs and pancakes for dinner! I see my own kids getting excited the same exact way when we make breakfast for dinner too. It’s just so fun! I will admit, though, that taking breakfast outdoors took a little creativity. 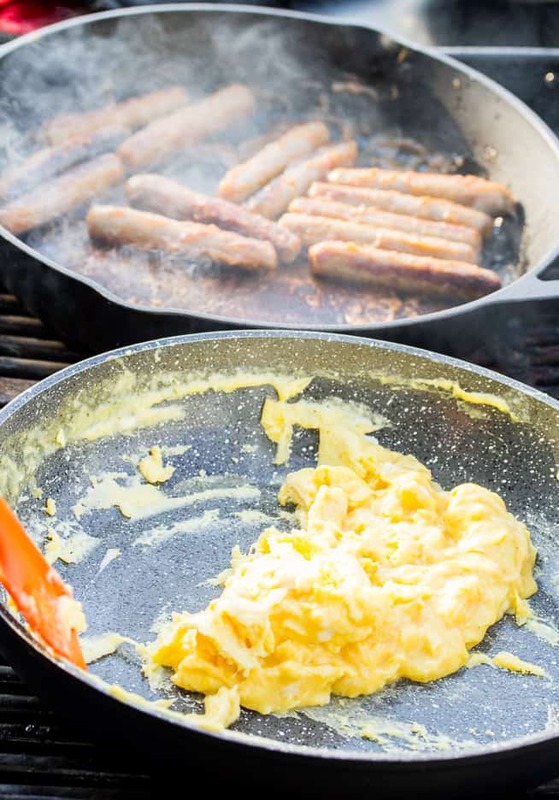 Rather than grilling on the actual grill grates, we use cast iron pans to cook the eggs and sausage links. You could grill the Smithfield Hometown Original Fresh Breakfast Sausage Links directly on the grill if you prefer. I also like to make the Sweet Mango Barbecue Sauce ahead of time and keep it in the refrigerator until I need it, but you can make it right before you start cooking, as well. Everyone had a blast eating Grilled Sausage & Egg Sandwiches with Sweet Mango Barbecue Sauce while spending time together and then watching a movie outdoors. This is what summer is all about! For this recipe I use Smithfield Hometown Original Fresh Breakfast Sausage Links. They also come in Bacon and Maple flavors, if you would prefer either of those flavors in your sandwiches. Smithfield Hometown Original Fresh Breakfast Sausage Links are made with premium pork and are gluten free. Plus, they don’t contain any MSG. You can feel good about adding this sausage to all your breakfast dishes and sides! You will need to first cut the mango into smaller chunks. Crack the eggs into a bowl, season with salt and pepper and whisk until well combined. Mince the cilantro or parsley, if you’re using it. 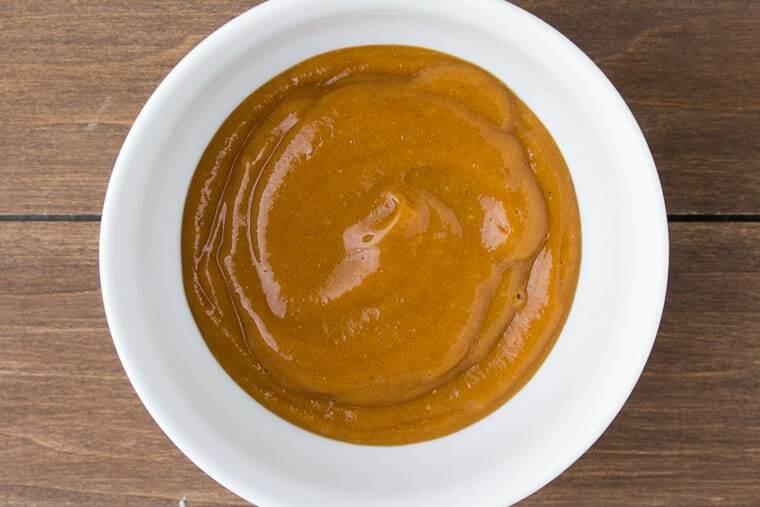 To make the Sweet Mango Barbecue Sauce, add the mango, ketchup, brown sugar, Worcestershire sauce, apple cider vinegar, garlic powder, and onion powder to the canister of your blender. Process until smooth. Light your grill and set it to medium heat. In one cast iron pan, add the Smithfield Hometown Original Fresh Breakfast Sausage Links. Cook for 5-7 minutes, rotating until browned all around. Add half of the Sweet Mango Barbecue Sauce and continue cooking until cooked through. In the other pan, melt the butter and add the eggs. Stir the eggs regularly until cooked through, then remove from the heat. To assemble the sandwiches, divide the eggs evenly between 6 long rolls. Top with 2 sausage links and a spoonful of the extra Sweet Mango Barbecue Sauce, if desired. Garnish with minced cilantro or parsley. Give this recipe a little twist by using Smithfield Hometown Original Fresh Breakfast Sausage Patties instead and make breakfast sliders! Yum! 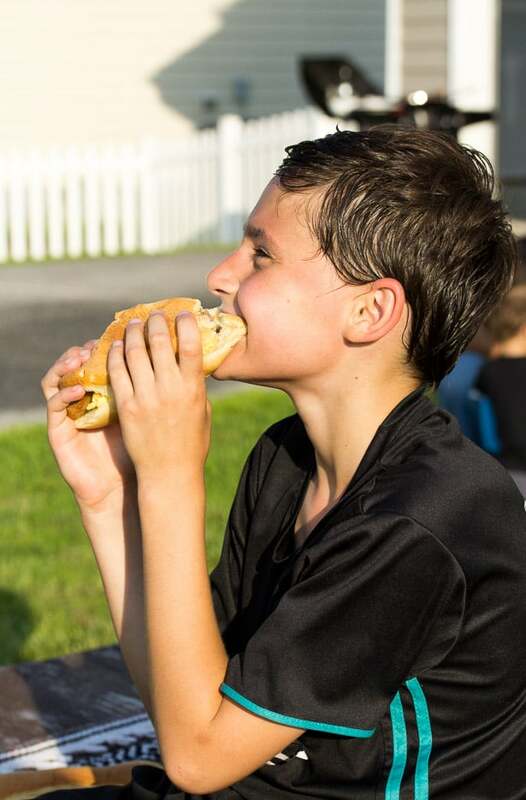 Love this recipe for Grilled Sausage & Egg Sandwiches with Sweet Mango Barbecue Sauce? Follow us on Pinterest, Instagram, and Facebook for more! PREP: cut the mango into smaller chunks. Crack the eggs into a bowl, season with salt and pepper, and whisk until well combined. Mince the cilantro or parsley. Light your grill and set to medium heat. In one cast iron pan (or oven-proof pan) add the Smithfield Hometown Original Fresh Breakfast Sausage Links. Cook for 5-7 minutes, rotating until browned all around. Add half of the Sweet Mango Barbecue Sauce and continue cooking until cooked through. In a second cast iron or oven-proof pan, pan, melt the butter and add the eggs. Stir the eggs regularly until cooked through, then remove from the heat. To assemble the sandwiches, divide the eggs evenly between 6 rolls. Top with 2 sausage links and a spoonful of the extra Sweet Mango Barbecue Sauce, if desired. Garnish with minced cilantro or parsley. That mango barbecue sauce sounds delicious! I can think of all sorts of things it would be great on. Yum! Such fun ideas for summer! These sandwiches look absolutely incredible. I would love to try that sweet mango barbecue sauce. This is such a great meal and such a fun party idea! Perfect way to turn a hearty breakfast into an on the go option! Yum! Perfect breakfast sandwich. My family would love this! I love the fact you use mango in this sauce. I just made barbecue sauce and now I need to try this sounds so good!